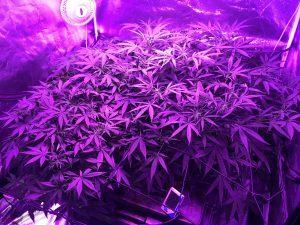 Choosing a fantastic grow light for your indoor garden might be a stressful and confusing task. Most especially if growing weed is completely new to you. f you are a beginner and a new grower, you might think that spending on a very expensive light may not be ideal. So we bring you two of the best yet affordable LED grow lights from a very famous company, Mars Hydro. In this post, we will be talking about the Mars Hydro 300W and Mars Hydro 600W. Included are their benefits and disadvantages, well-loved features, and other important details. Mars Hydro has been to specialize in the LED grow light for both commercial and home use. Despite their large variety of famous great lights and reflectors, they are known to be really affordable and easy to purchase. Mars Hydro has been in the business since 2009, continually producing better and awesome products. 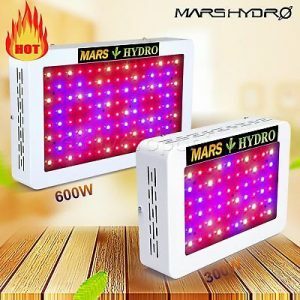 Being established in the industry for long years, Mars Hydro grow lights have created a great reputation among home growers and commercial growers for quality products with prices that are very competitive. The Mars Hydro LED grow lights are known to be the cheapest LED grow lights in the market. And despite being cheap, this awesome grow light can truly deliver. You can always get the best value price compared to the same quality lights on the market. Mars Hydro has a range of worldwide warehouse across the USA, Canada, UK, AU, Germany. Fast shipping within 3~5 business days, no customs tax needed. They are also available on Amazon so that wherever you are in the world, the Mars Hydro will always be within your reach. The Mars Hydro 300W is one of the most famous and cheapest LED grow light in the market. One of the most loved features of this grow light is its effectivity in saving electricity. Although this will not be considered as a professional grow light panel, it remains very efficient when used in personal grown Cannabis. May it inside grows tents, closets, or small greenhouses. The Mars Hydro 300W is a great beginner LED grow light which can be best used for seeding, vegging, and growing your cannabis. It is also suitable for various growing environments. This Mars Hydro grow light contains 60 tiny LED lights that produce a total of 300W. It consumes only up to 135 watts. The grow light is available with the full spectrum which will give your plants a purple touch of lights. It can cover 450 ~ 475 nm, 620 ~ 630 nm and 650 ~ 660nm. The purple tint that this grow light provides is great for vegetable, marijuana, and flowers. The Mars Hydro 300w grow light can also efficiently save your energy with flexible coverage. When it comes to safety, this grows light is also a sure shot. It is known to be truly safe and eco-friendly. It tested and passed US authoritative ETL certification. Also, light has no chemical or electrical smell. The Mars Hydro 300W LED grow light consists of 60 small 5-watt Epistar LED lights. These LEDs produce a light equivalent of 300 watts. Fortunately, it consumes only 135 watts. Furthermore, it gives out a full spectrum light with a wavelength range of 430 ~ 440 nm, 450 ~ 475nm 620~630nm, 650~660nm. Its 5-watt chips are powerful enough for deep canopy penetration. They are better compared to the 3-watt chips used in most other LEDs. This has been fine-tuned to suit not only cannabis but also flowers and vegetable plants. The Mars Hydro 300W offers a well-balanced spectrum that incorporates a broad range of wavelengths: 430 ~ 440 nm, 450 ~ 475 nm 620~630nm, 650~660nm, and white. This spectrum is perfect and suitable for all stages of growth. This is the reason why many growers have said that LEDs provide faster, healthier growth since they know exactly which kind of light to deliver. With around 140 watts of power consumption, the diodes aren’t driven to their maximum capacity. In order to provide longer lasting parts, MarsHydro made a smart choice by not running all of the LEDs over a stable limit. Each diode is behind a small lens that projects the light in a mixed 90 and 120-degree pattern to provide better coverage to the garden canopy. The balanced full-spectrum is what the plants are craving and it can deliver it with the right amount of intensity. The optimum growing area is limited to 24-inch x 24-inch for a grow light like this. We recommend that you use it for an18-inch x 18-inch area during flowering for better results. Each diode of the Mars Hydro 300W grow light is covered by a small lens that focuses the light on to the canopy. With a mixture of 90 and 120-degree angles, it provides great coverage and penetrates with good intensity. It’s not super-powerful so it’s perfect for smaller plants or small-scale grows like smaller grow tents, the case grows, stealth boxes or closet growing. We all know how any type of light can be capable of emitting heat. If you are concerned about too much heat, we are happy to let you know the 300W Mars Hydro gives out less heat compared to other grow lights. Thus, making heat less of a concern. Inside there’s a large diameter cooling fan that’s constantly spinning when the light is turned on. It blows cool air over the heatsink that dissipates the hot temperatures away from the diodes to create a better environment for them to run at their best efficiency. These cooling mechanisms mentioned above seem to be doing a very good job when it comes to safety. It protects the diodes from failure and burnouts. Another smart feature that we noticed with this Mars Hydro grow light is not driving diodes to their maximum capacity. Running LEDs over a stable and comfortable limit ensures that the parts last longer. In addition to that, they serve to protect each diode. If you look at the arrangement of the diodes, you’ll also observe a small protector situated right next to each LED. These are designed so that if one diode burns out, it won’t cause a successive reaction and shut off all of the diodes. This affordable LED grow light has a heatproof tube. This tube effectively eliminates the risk of the LED light catching fire. Their safety features made them pass the US authoritative ETL certification tests. specs details taken from this post. Great and ideal for beginners. Full-spectrum light, ideal for all growth stages. Safe and reliable cooling mechanisms plus easy maintenance. Simple and easy set-up and easy adjustment. Great durability with a lifespan between 50,000 to 100,000 hours. Eco-friendly with no chemical or electrical odor emission. VDE and UL certified plugs and wiring. Not ideal for professional growers, or for those who grow cannabis in a wide and bigger area. Not suitable for super large productions and operations. The light is small, which means it’s not ideal for maximizing yields of multiple plants during flowering. The grow light doesn’t have a switch to turn it off, which means you will have to unplug it as a whole. Cooling fan can be a bit noisy. If you are a beginner when it comes to indoor cannabis growing, then we could say that the Mars Hydro will be right for you. This LED grow light will be perfect for those who are still exploring the world of indoor growing. We are also pleased to let you know that most users of this 300W LED grow light have been delighted and satisfied with its performance. With an average lifespan of 50,000+ hours, the MarsHydro Mars300 LED Grow Light is an excellent choice for those that don’t want to exceed spending too much on a lamp. Despite the cheap price, this light is able to produce decent flowers. If you plan on using it for seedlings, cloning, and vegging, it’s sure a great choice. We found that young plants absolutely love it and did significantly better underneath the Mars Hydro 300W. The panel of the Mars 600W LED grow light measures 17 x 11 x 3 inches. The Mars600 weighs 9.85 pounds and comes with a steel cable hanging kit. The Mars Hydro 600W is an efficient and low-cost option that will suit indoor growers of all skill levels. It is an easy system to assemble and maintain. The Mars Hydro 600 is composed of 120 5W Epistar LEDs that are able to emit a full spectrum for the best yield. It boasts Epistar which is a decent chip manufacturer, something which instantly puts this light above other budget lights. Any beginner to intermediate grower will absolutely be able to boost yields and productivity by utilizing the Mars Hydro 600W grow lights. Making 600W grow light this one an excellent choice for your indoor cannabis. The LED lightings in the Mars Hydro 600W fixture have unique positioning. Some of the LEDs are angled at 90 degrees, others at 120 degrees. They are made of high-quality 5W Epistar light bulbs that do great as an efficient grow light. The quality of light that the Mars Hydro 600W emits is not only suitable for cannabis, but also for other plants and vegetables. 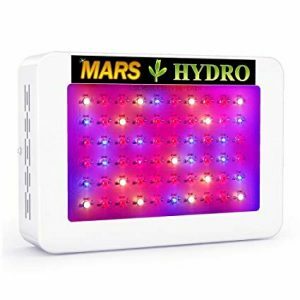 The Mars Hydro 600W is referred to as a full spectrum grow light with ratios of blue, white and red spectra. These different light spectra are suitable for the vegetative and flowering stages. This LED grow light boasts a particular wavelength or spectrum as follows: 430 to 440 nanometers (nm), 450-475 nm, 620-630 nm, and 650-660 nm. The purplish shade spectrum of light which is good for vegetation and seedling. During blooming, plants need more of red light than blue light in order to produce heavier and resinous buds. The Mars Hydro 600 certainly has a decent and efficient light spectrum suitable for your cannabis. Since the 600W is a bigger sibling of the 300W, it also has a wider and better coverage. The Mars Hydro 600W LED grow light will be able to cover a grow tent of 100 cm by 100cm by 180cm. This area can be enough and quite a big space to grow your marijuana. Recommended height from plants in vegetation phase is 24 inches. This coverage area by a 600W is already good enough for a beginner and for those who still want to try and test things out. The Mars Hydro 600W is strategically equipped with multiple fans for the purpose of intake as well as exhaust. Similar to the 300W version, it also produces 56 DB of noise. Some people may consider it a bit noisy for their liking, but most are totally just fine. The grow light is also built with massive pin cushion heat sink which keeps the temperature inside your small grow tent pretty much cooler than any other HPS/MH grow lamps. No matter how long you leave it this LED grow light on, it will keep cool as it has a robust and reliable cooling system. To ensure your safety, the Mars Hydro 600W light complies with various different safety certifications such as CE, RoHS, ETL. It has a failsafe diode design, so if one chip fails, the light still works. The fixture is also built with high-quality materials so you don’t have to worry about sub-standard built and assembly. This Mars Hydro is created with a heatproof tube thus zero risks of catching fire. The plug that is safely made with UL and VDE Certified wires. When it comes to the safety of these Mars Hydro LED grow lights, when properly used, it is 100% guaranteed. Affordable and easy to purchase. Efficient full-spectrum light and great brightness. Effective PAR value and lumens output. Strong and durable design with an average lifespan of 100, 000 hours. Mixed focusing angle for even spread and distribution of light. 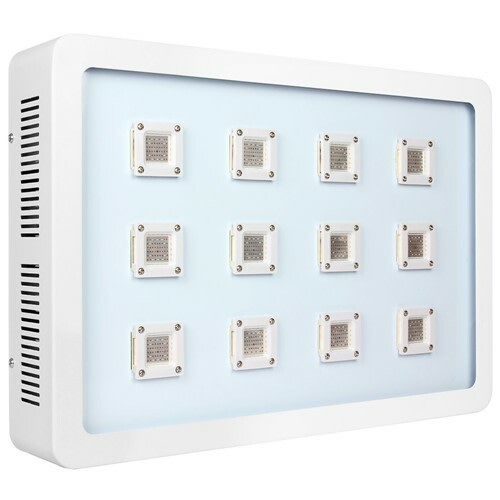 Compact LED grow light great for indoor growing. The fan can still be a bit noisy. The Mars Hydro 600W is considered to be the older sibling of 300W. But when it comes to functionality and durability, this one is just as good! Similar to the 300W, the 600W is also great even for beginners or for those who grow the minimum amount of cannabis. This LED grow light is loved by most growers and even boasts a high rating at Amazon. One notable feature of the 600W is that it has a longer lifespan when compared to the 300W. 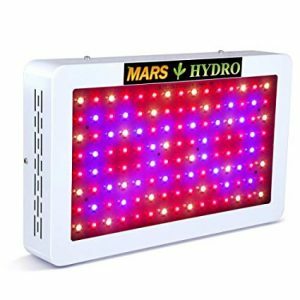 So if you are planning to buy an affordable LED grow light to use for a longer period of time, the Mars Hydro 600 is perfect for you. This inexpensive grow light is a perfect choice for a beginner or entry-level growers, making the entire process simple, fun, and easy. Read more posts on Mars Hydro here.